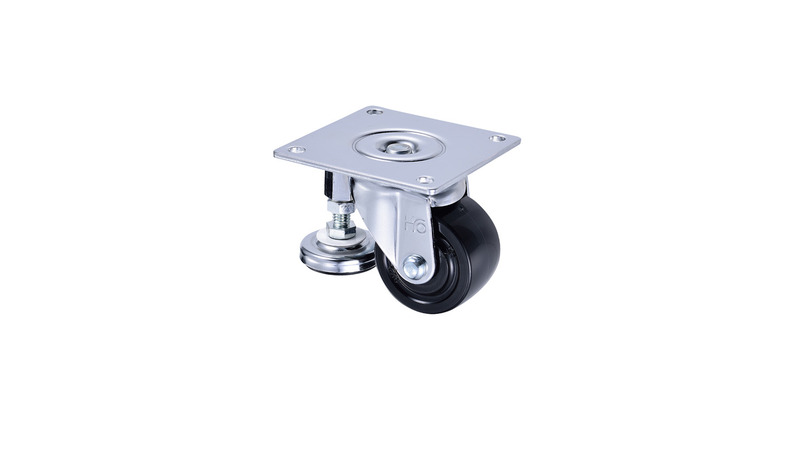 A320T- 75x50 mm nylon adjustable caster, it is used for the equipment that needs to be stopped when moves to the fixed point and adjust the height. There are two choices of wheel materials, nylon and phenolic. 1. Wheel: High grade of nylon wheel, which is injection molding, with the features of wear, moisture, corrosion resistance and high load capacity. 2. Bearing: Roller Bearing- increases the load capacity. 3. Fork: Pressed steel and integrally formed to be stronger and more durable. Chrome plated. 4. Leveling Feet: Zinc Plated. Spacer is made of grease resistance rubber which is anti-slippery, shock absorbing and can adjust the level.